Jesus, the second person of the Trinity, is the long awaited Messiah. But Israel expected a very different Messiah: one who would liberate them from their oppression and who would re-establish the kingdom of Israel. Jesus, however, makes it clear that the kingdom he came to establish is of a higher order. In a recent article from the Financial Times, Pope Benedict XVI wrote that the birth of Christ was meant to usher in a different and "far greater peace" than those awaiting the Messiah could imagine. "Jesus is present to us as King David's heir, but the liberation he brought to his people was not about holding hostile armies at bay; it was about conquering sin and death forever." Jesus Christ, the King, came to proclaim and to establish the Kingdom of God. He proclaimed the Kingdom of God and not just any kingdom. As Pope Benedict XVI states in the first installment of Jesus of Nazareth, when "Jesus is proclaiming the Kingdom of God, he is proclaiming God and he is proclaiming him as the living God." In announcing the Kingdom of God, Jesus is not proclaiming a new or improved political realm. He is not ushering a new age of military control or governmental authority. He is instead announcing the living God. Jesus' entire message is that God is really God. He asserts that God's saving power is always present and acting in the world: "the Kingdom of God is at hand" (Mk 1:15), it "has already come upon you" (Mt 12:28), it is "in the midst of you" (Lk 17:21). According to the Holy Father, the proximity of the Kingdom of God – of the active power of the living God – is found in Jesus himself. Through Jesus, God has entered history in an entirely new way. As his name indicates, Jesus is the salvation of God. He is Emmanuel, the promise of ages, the Messiah long foretold and awaited: God is with us. This has implications for all of us. Christmas is the season of hope, joy and peace because it is the announcement of the birth of our saviour. Marshall McLuhan considers that the medium is the message, and similarly, Jesus is the message, only in a much deeper way. Jesus is the hope, joy and peace that he himself proclaims. When we celebrate Christmas, we celebrate the active power of the living God. We commemorate this by contemplating the Word of God, and like Mary, pondering that Word in our hearts. We make Christmas merry by becoming agents of the active and saving power of the living God in our world. 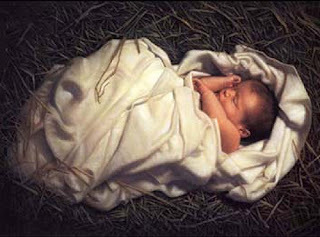 We pay tribute and extol the baby King by giving to others the gift that keeps giving: Christ himself. We can do this by proclaiming to the whole world this Christmas season that God is really God and he is with us. We bring Christ to others when we sow love where there is hatred, and we bring pardon where there is injury. We live the Christmas message when we allow our faith to witness to others that nothing is impossible for God. We celebrate the birth of Jesus when we live for the greater glory of the Father. When we stare into the despair, darkness and sadness of this world, and we respond with hope, light and joy. The Baby is coming. And how! "...the proximity of the Kingdom of God – of the active power of the living God – is found in Jesus himself." I love this sentence. It kind of makes Christmas a bit frightening in the sense that we remember who this Jesus really was: how he was born, how he lived, how he died, etc. As with most religious tradition, it's easy to polish up and sugar coat the reality of what God has done. When I consider that the kingdom of God and Emmanuel "is found in Jesus himself," I am both excited and frightened. I'm reminded of Frederick Buechner's thought on the incarnation (I can't remember where he wrote it) in which he describes the incarnation as the revelation that God is no longer predictable or "safe". But at the same time, Jesus reveals that God is, as you say, hope, joy, and peace for the world.